A staple food throughout the tropics, different countries have so many beautiful ways of cooking, grilling or frying plantain. 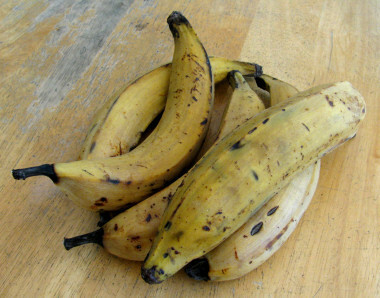 It's called many names including dodo, fufu, kelewele, makemba, tostones or chifles, ipekere or aloko. Eaten when they are yellow with black spots or when they are fully ripened and skins are all black.Plantains are a great source of potassium and Vitamin A. One of these fruits also has about half your Vitamin C requirement for the day, and fair amounts of magnesium, phosphorous, selenium, other B Vitamins, calcium, iron, zinc and copper. Since plantains have a low sugar content they are a good complex carbohydrate choice, and they also contribute a small amount of protein to the diet.